The Bear River Valley really stepped up in support of the Tremonton Community Food Pantry this past month raising $9,080 to go toward this invaluable community resource. 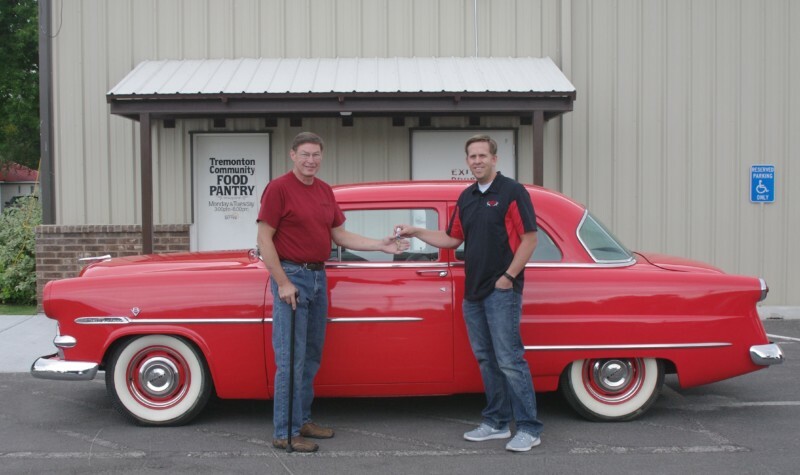 In an effort to raise donations and community awareness of the Food Pantry, a Bear River Community Member donated a 50th Anniversary Edition – 1953 Customline Ford to Tremonton City and the Food Pantry. The Tremonton City Council wanted to give all residents of the community an opportunity to get involved and support the food pantry so they decided to host a drawing where one lucky person would walk away the proud owner of this classic car. Tickets were sold and major events around the valley, at the Tremonton City Office as well as Online for $20 a ticket or 6 for $100. Over 400 tickets were bought and even more awareness brought to the Food Pantry which was the main goal. On Friday, September 19, in conjunction with the Play Unplugged Summer Sendoff, Ellen Cook of the Tremonton Leader preformed the Drawing pulling out Ken Richins winning ticket. Ken resides here in Tremonton and told us he had only bought one ticket online with his wife just to support the Food Pantry like they have several times in the past, of course wanting to win but not at all expecting to. Congratulations Ken! And Congrats to the entire Valley on bringing awareness and much needed donations to the Food Pantry.